As demonstrated by H.G. Frankfurt, we are surrounded by b******t.
One of the methods for spotting b******t it is the “not test“. As explained here and there, this test checks whether “it is possible to negate the statement and create a sentence that any sane person would utter in public“. The “not test” has been applied by development economists to G20 declarations. In concrete terms, the idea is to take a speech and turn its sentences to their opposite, i.e. turn all positive sentence to negative and vice versa. If the revised sentence makes sense and could equally be voiced by the speaker, then it enshrines worth content. If, on the other hand, the changed sentence makes no sense and would never possibly be pronounced by the speaker, then it is a vacuous statement which conveys b******t.
Now let’s see whether b******t is also pervasive in the antitrust field. To apply the “not test“, I have chosen a policy speech of former Competition Commissionner Neelie Kroes. I apply it to bits and pieces of the speech which seem to convey opinions rather than descriptions. Instead of systematically using the “not” word, I occasionally apply antonyms. PS: I suppose only die-hard fans of AC/DC-like sound will know the LP that illustrates this post. 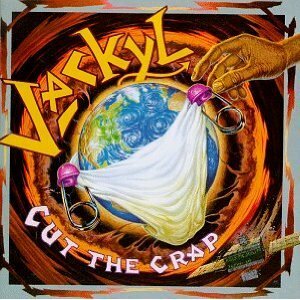 Jackyl was a great band, and their titles are worth re-listening.